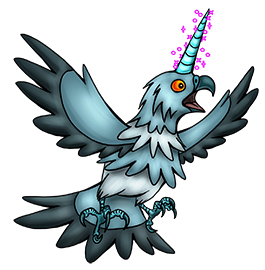 This Kreature has the ability to scatter sparkles from its wand-like horn which can dazzle and confuse its enemies, leaving them open to being poked and stabbed. Its horn was once believed to possess mystical properties when ground into a fine powder. However, while this powder can put on an impressive light show when mixed with certain chemicals, it doesn't have any real medicinal value. Never the less, its wild ancestors were hunted to extinction in some areas. Strict conservation programs have since allowed its population to recover and its kind have become common once more. It feeds primarily on nuts and fruit but it enjoys supplementing its diet with carrion and small prey now and then.